Please, sir, can I have some more? Flowers, that is! I can never have enough blooms scattered throughout my apartment: peonies and snapdragons and tulips, oh my! And cymbidium orchids…sigh. Lucky gal that I am, I live mere steps from Ave and Dav, home of Toronto’s top flower markets, and often pop into the series of small shops lining Avenue Road (south of Davenport Road) for fresh flowers on the cheap. But this girly girl can’t always splurge on the real deal, so she’s learned to embrace the everlasting. And what tops my list of fabulous faux flowers? Urban Barn’s über-realistic Phalaenopsis orchids in a luscious deep fuchsia they call purple (it’s so me!). In such a spectacular shade – which conveniently complements the chic charcoal grey cushion I’m currently coveting from Urban Barn – a potted single stem ($40) or a few loose stems ($14 each) will go a long way, injecting instant impact into any style of space without blowing your budget. Plus, the slender stems are flexible, so you can shape the loose ones to suit a variety of vases, or even bend the bottoms completely to fit a compact container. True, they cost a bit more than the flowers at your local market, but remember, these beautiful blooms are a hardy species – they’ll last years beyond the two weeks you might get from freshly cut ones. And you’ll never have to water or feed them! 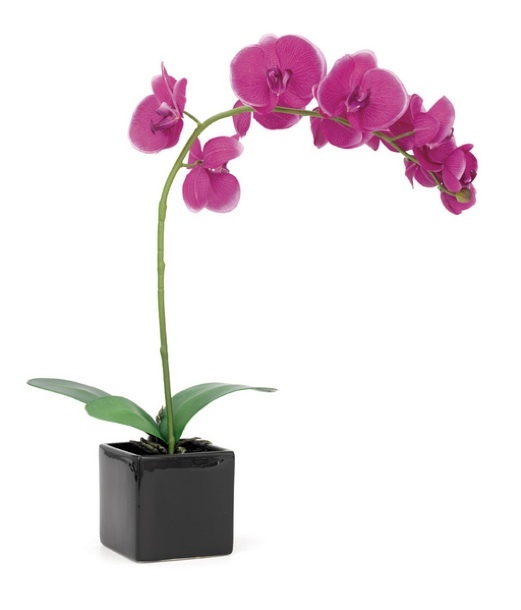 Available potted (28-inch stem, shown, $40; 16-inch stem, $35) or as loose stems ($14 each), this everlasting orchid is a perennial favourite from Urban Barn. It's an affordable way to add some pretty to a space. Photo courtesy of Elevator Communications Inc.